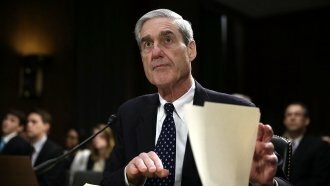 Trump Says Mueller's Investigation Has Cost Almost $20M — Has It? The president says Robert Mueller's Russia investigation has run up a tab of nearly $20 million. But that's not quite accurate. The president recently claimed special counsel Robert Mueller's Russia investigation is about to top $20 million in costs. That's not quite true, and it needs some context. Mueller's office says it racked up $3.2 million in direct spending during the first four and a half months of its inquiry. That's staff salary and benefits, equipment, travel, rent, utilities and supplies. If you use that benchmark for the rest of the year that the investigation has been going on, it would come to about $8.5 million. That's way less than $20 million. So where did the president get that? Well, if you include indirect spending in the number, it would come to about $17.9 million over a year. But Mueller's office argues indirect spending is money taxpayers would be paying anyway. It includes salaries for people who would be working on other government projects if they weren't doing work for Mueller's team, so they'd still be on the government's payroll. So the president's claim that the Mueller investigation has cost almost $20 million is only close to true if you include indirect spending, and that might not be an accurate reflection of how much additional taxpayer spending is needed for the probe.